This week we scaled Mondelez’s HQ to take a clear message to the company’s bosses. They must stop destroying the Indonesian rainforest for dirty palm oil, because as the trees come crashing down, so do orangutan numbers. Every day we lose 25 orangutans. 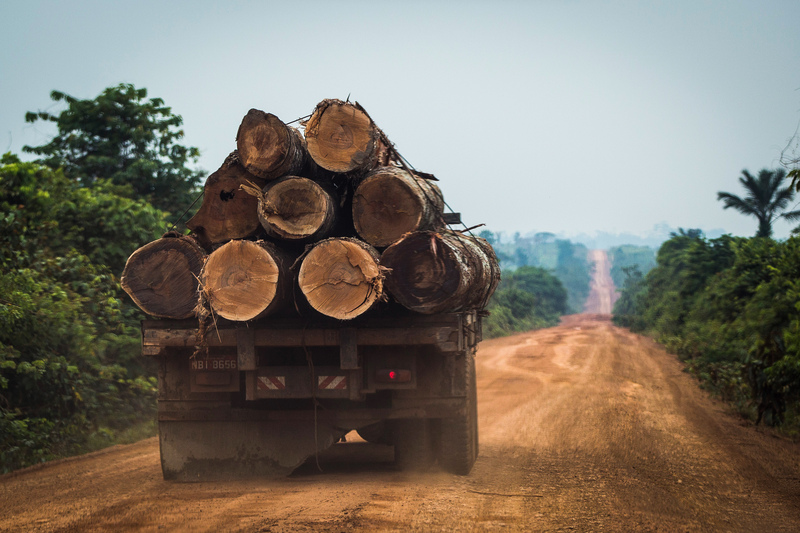 The world is talking about palm oil and the devastating impact it is having. We know it can be produced without destroying rainforests, and that’s what Mondelez (the makers of Oreo) promised their customers they’d do by 2020. But with less than 500 days to go, they are way off track. Climbing is vital to ensuring our palm oil message gets heard. That’s why our climbers scaled Mondelez HQ. With only 500 days to hold Mondelez to their promise, will you help ensure we have the equipment needed to keep up the pressure and hold companies to account? 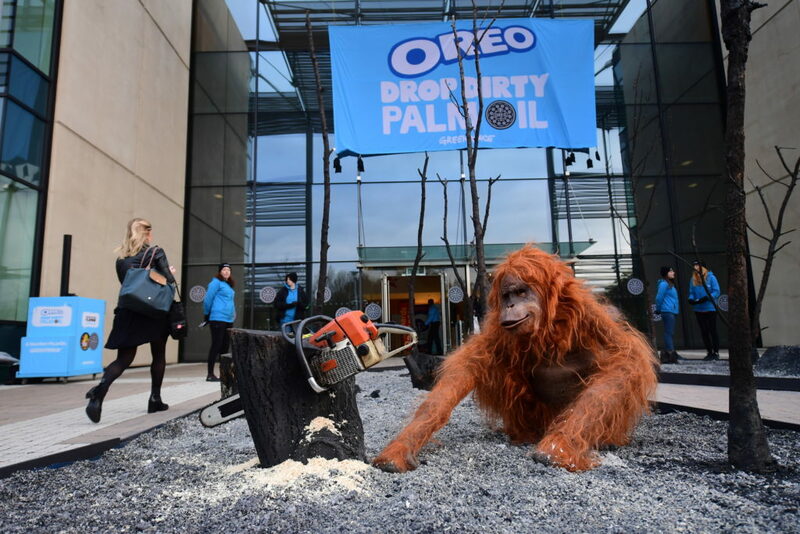 Greenpeace volunteers create a burnt smouldering rainforest with a lifelike animatronic orangutan at the headquarters of Oreo cookies near Uxbridge, UK. We are calling on Mondelez to stop buying from Wilmar International, the biggest and dirtiest palm oil trader in the world. That’s also why, over the weekend, over the weekend, 6 climbers also boarded a giant tanker loaded with palm oil from Wilmar International. They unfurled a banner calling on them to drop dirty palm oil. The striking images of our climb team’s actions made the news and were shared widely on social media, ensuring Mondelez and Wilmar can’t hide from the the damage they are doing. There were so many things that our climb team could have been scared of when they were climbing yesterday. But we knew that they had to do it, the Indonesian rainforest is too important to lose. It’s not just the climbing equipment that we need to pay for. There’s the months of investigations, planning and training that goes into making sure our messages are heard. 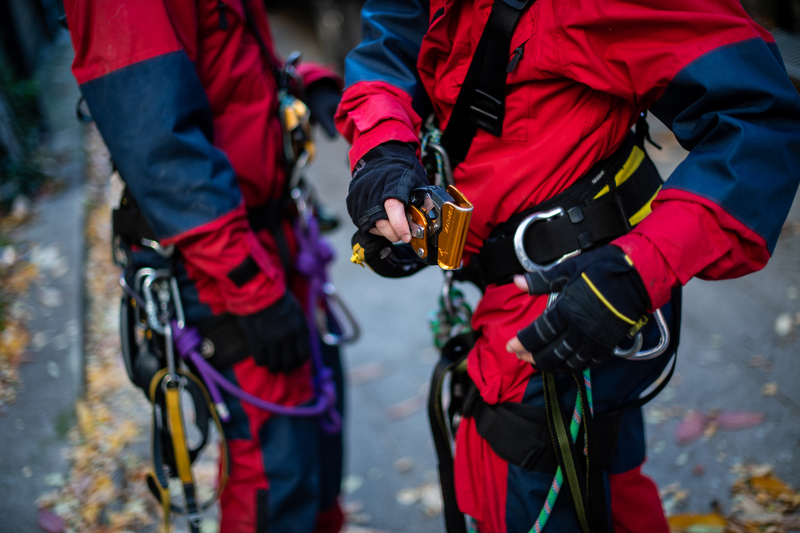 All of our climbers are experienced, thoroughly trained and confident in their abilities. But, ultimately, we rely entirely on the equipment to do its job. Our actions have real impact and this week we achieved something incredible. We sent a clear message to the companies destroying the Indonesian rainforest, ensuring Mondelez and Wilmar can’t hide from the damage their products are doing to the rainforest and the animals that call it home. We need to keep up the pressure and hold companies to account by continuing peaceful actions just like yesterday’s. Please will you support us today and help buy new climbing equipment? P.S. With only 500 days to go, will you help ensure we have the equipment needed to keep up the pressure and hold companies to account? Please, give a gift to support us today.